What it is: Consistent assignment means residents have the same CNAs and nurses caring for them every day whenever these staff are working (for implementation guidance and how-to’s, please visit Pioneer Network’s web-based Starter Toolkit and newly released Implementation Handbook for Engaging Staff in Individualizing Care). Why it is important: Stability at the point of care allows residents to be cared for all the time by staff they know well. These staff become expert in meeting residents’ needs, and develop routines for working together with consistent co-workers. Mary is an 85 year old woman in the middle to later stages of dementia. She has recently moved into a nursing home. How did consistent assignment help Mary? Daytime Discovery: In working with Mary in the mornings, her consistently assigned day shift CNA uses a “sneak peek” to check on Mary regularly in the morning to determine when she is ready to rouse.The CNA learns Mary’s morning routine is to sleep in and she tells the nurse who communicates with other members of the interdisciplinary team (e.g., therapy and dining) to be sure that Mary can eat breakfast mid-morning and have her therapy scheduled later in the day. Evening Discovery: In the evening, Mary’s consistently assigned CNA notices that she has a visitor. Through the neighbor, the CNA learns that Mary was very devoted to her career and has no children. She had a husband who passed away 10 years earlier and she mostly socialized with work colleagues prior to her retirement. 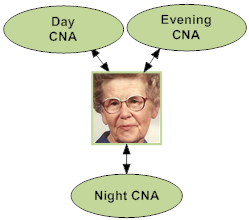 Nighttime Discovery: During the night, Mary’s consistently assigned CNA notices that she is very active. She becomes agitated with her CNA when they bring her back to her room to help her go to the bathroom (she does not want to go and wants to stay in the dayroom or by the nurses’ station). Through several conversations, Mary’s CNA learns that Mary worked as a night-shift nurse. The CNA finds that it calms Mary’s agitation to ask about her clinical experiences. She also puts a chair at the nurses’ station for Mary to visit throughout the night. Staff Communication: Staff compare notes on Mary’s responses and preferences, as they put together a more complete understanding of how best to care for her. 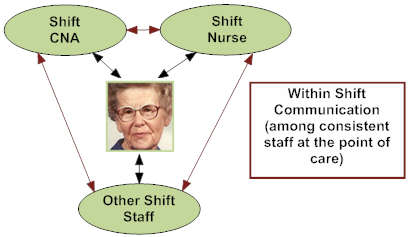 In this scenario, Mary’s CNAs and nurses share knowledge regarding Mary’s background and customary routines through within shift huddles and between shifts through a communication notebook. The knowledge that Mary is a nurse spreads quickly and staff call her “Nurse Mary” and engage her in conversation. These consistently assigned CNAs and nurses share ideas and information such as engaging with her on medical topics and asking “Nurse Mary what would you do?” to empower and engage her in her own care. They also better coordinate her daily schedule. For example, her evening CNA shares in the communication notebook that Mary was up very late and will likely not rouse for breakfast until much later in the morning. What might happen WITHOUT consistent assignment to help Mary? Without Consistent Assignment: Because staff keep changing, Mary never recognizes any of them and feels a series of strangers keep coming in and providing very personal care. Anything she does tell one of them isn’t passed along so she has to start from scratch with each one. Personal information and observations that might affect her clinical care are not known or communicated resulting in potential negative repercussions for Mary. The unfamiliarity of the staff and their unfamiliarity with her leads her to be more agitated in daily care. Daytime: Not realizing that Mary likes to sleep in (due to lifelong rhythms and career), non-consistently assigned CNA’s attempt to rouse her in the early morning for breakfast. Mary is agitated and the CNAs need extra time to get her ready (resulting in challenging mornings for Mary and her caregivers). Evening: Any personal information learned from Mary’s few visitors is not efficiently or effectively utilized in Mary’s care. Night: Not realizing that Mary’s activity in the evening is due to a lifetime career as a nightshift nurse, Mary’s CNAs keep ushering her back to her room. Mary becomes agitated and her behavioral expressions become increasingly negative. She is sad and depressed. Because staff keep changing, Mary has to start from scratch with each one. Personal information and observations that might affect her clinical care are not known or communicated resulting in potential negative repercussions for Mary. Without Staff Communication: Without opportunities to communicate, Mary’s CNAs and nurses will not have crucial information to understand and meet Mary’s needs. They lose the care, time and resource efficiencies of shared knowledge resulting in communication barriers.